Well, what’s a trip to Hyderabad without visiting the Charminar? 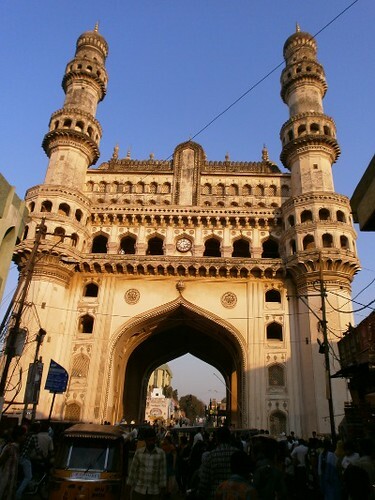 Even though I was in Hyderabad for only one day, I decided that I will visit Charminar, no matter what. 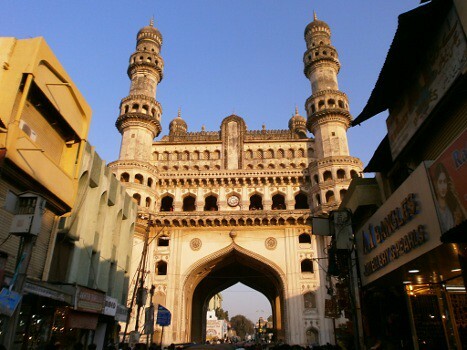 So, after the Salar Jung Museum and Chowmahalla palace, I headed straight to Charminar! Ok, I do agree that the Charminar captured by my camera doesn’t look as big or majestic as other photos available on the Internet, but this is a more realistic version. I have seen some night photos/long shots of the Charminar which look amazing, but then with finite amount of time to spend in this place (and due to the lack of long-shot photography skills), this is what I was able to get. Actually, when I started from the Chowmahalla palace, it was around 5:00 PM. If I had gone straight to the Charminar, I would have been able to climb above the spiral stairs and enjoyed the view from near the clock (in the above picture). I could have even taken photos from there and enabled you people to see the view from there too. Little did I know that the timings for going up the stairs in the Charminar closes by 5:30 PM! So, I was able to only watch these people from outside 🙁 But the butter masala dosa was too good – don’t miss 😉 Now for some gyan on Charminar – ‘Char”Minar’ means Four Minarets. As you can see in the photos, there are four tall (56m) towers/minarets in the corners of this square structure, which measures – 20m x 20m. It seems that the Charminar was built in 1591 AD by Sultan Muhammad Quli Qutb Shah, the fifth ruler of Qutb Shahi dynasty. 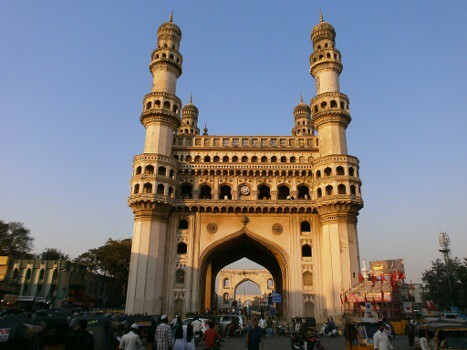 It seems it was built to commemorate two events – The shift of capital from Golkonda to proper Hyderabad and the elimination of a plague epidemic from the city. This is the best shot of Charminar I was able to get. 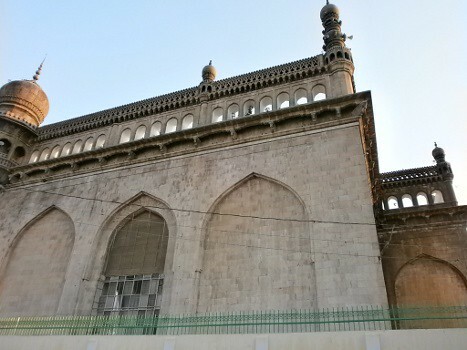 Near to the Charminar, there is one more mosque (actually the biggest mosque in South India and third biggest mosque in India) – Mecca Masjid. Before going there, I asked one shop-keeper if I can go inside (as I was not a Muslim) and he told me, ‘Just go. How can anyone know that you are not a Muslim?’. But since I didn’t want to incite any Hindu-Muslim problems (my small contribution to maintaining cultural harmony) and the websites clearly mentioned that entry to the mosque is restricted only to Muslims, I decided not to go inside. Here are two photos that I took from outside the mosque though. 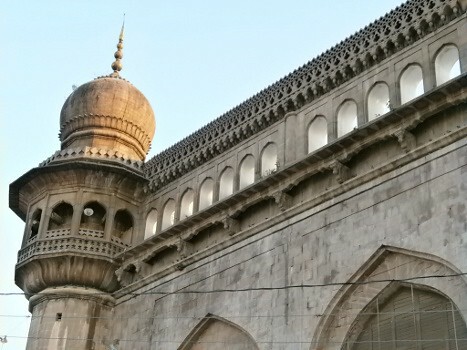 You can find more information on this Mecca Masjid from here. beautiful shots D.I thanks for showing us all this ..
Wow! 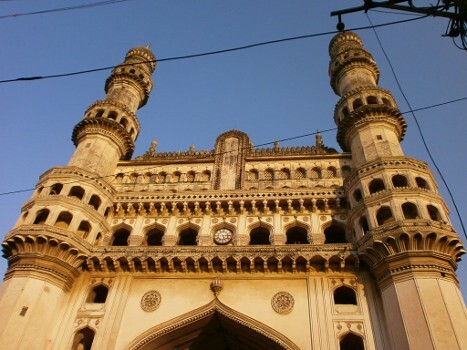 Charminar! The pictures are gorgeous DI! Loved every bit of it. The charminar is glowing with the sunshine hitting them. Thanks for those information. I’ve been to Hyderabad quite a few times during summer hols coz my aunt and cousins stay there. I’ve been to every place there, but I don’t have any pictures to reminisce about them. And i never knew any of these info about the place. I love chudi bazaar (bangle bazaar) – the street parallel to the entrance. And if you go there during night, it’s the most happening place with dazzling lights and shimmering glow that comes from the bangles. . This is one place I want to see one day! 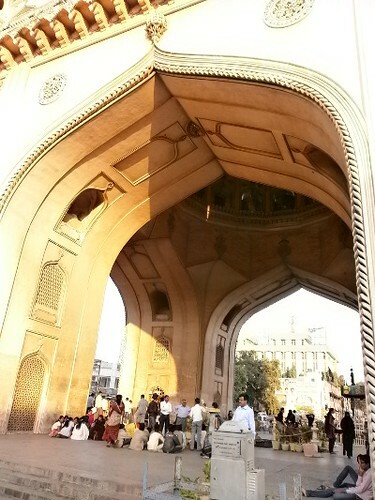 This Charminar is located right in the center of the old city. Whenever you go to Hyd, it’s going to be very easy to reach this place. If you had not eaten TWO masala dosas but climbed the Charminar, you could have saved some money, time and LOST calories too! Hmmm…. I had climbed this place and visited chudi bazaar too, a few years back, but missed to meet Saritha! Your pictures are good! I liked the huge saambaar vada they gave in the hotel! Masala dosa will wait for my next visit! Next time I am going there, I have decided what to eat – Sambar Vada! 🙂 Yes, I should have gone straight to the Charminar and climbed it. But I didn’t know about the timings. How I wish I could stay on in Hyderabad for at least ten days. This place seems to have a lot of interesting tourist spots. Fantastic angles and an impressive historic building. Never been to Hyderabad. Want to see Hyderabad and also Vizag. If you have some money to spare for tourism, then people prefer to go to Singapore, Malaysia and all. So distant Indian places become not so attractive. People are stunned when I say I don’t have a passport. Strangely, I think I am not going to take one in the near future.